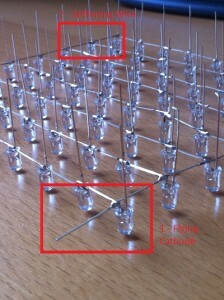 The exact dimensions of the cube will depend upon the length of the legs on the LEDs. The legs will be soldered together with the cathodes of the LEDs forming a horizontal plane and the anodes connecting the layers vertically. Measure the distance from the centre of the now horizontal cathode to the end of the leg and subtract about 2mm. 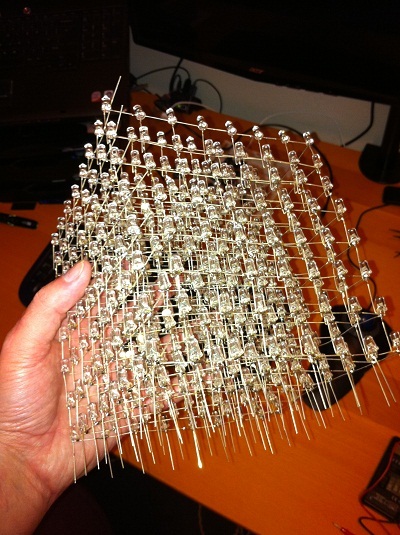 This will tell you how far apart the LEDs are in the horizontal plane. 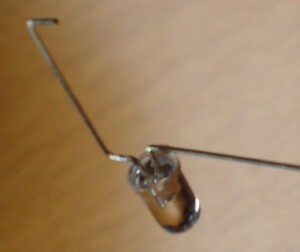 The 2mm will be used to overlap with the neighbouring LED and will be used to connect the cathodes. Now this is where the wood comes in. 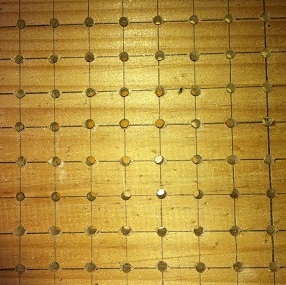 You need to drill a grid of holes 8 x 8 which are each this measured distance apart. You will end up with a template in which you can place the LEDs in each layer making soldering easier. 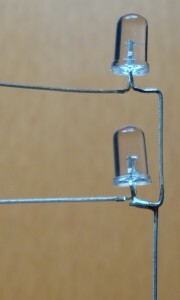 The holes in the template must be small enough to hold the LED firmly but not too firm. 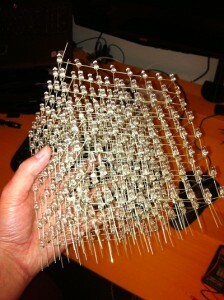 The LEDs will need to be removed later without placing too much strain on the soldered joints. So now let’s get the soldering iron warmed up and on with the first layer. Take 8 of the LEDs and place them along the top row with the cathodes all pointing to the right (or left if you prefer). 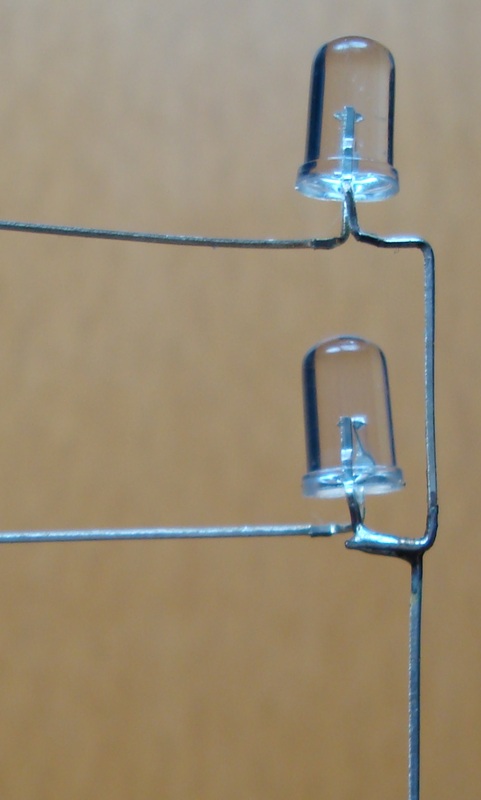 The cathodes of the 7 LEDs to the left will overlap slightly with the LED to the right. The rightmost cathode will go off into space. Solder the cathodes together. Congratulations, you now have a line of LEDs. Now test the layer. Simple enough, you just need a power supply and a current limiting resistor. 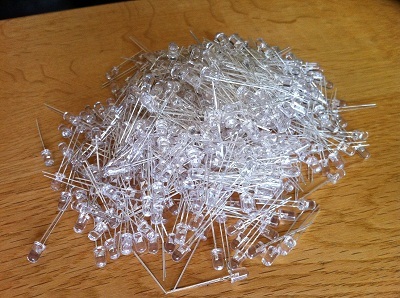 For the LEDs I had chosen a 5V supply fed through a 68 Ohm resistor is adequate. 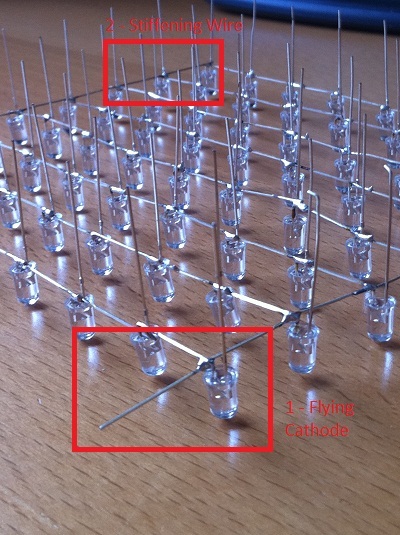 Connect ground to the cathode of the LED which is flying off into space (remember, it’s on the top row, to the right). Now touch each leg of the LEDs in turn with the positive output of the supply (through the current limiting resistor of course). The LEDs should light up and as you touch the anode. One final bit of soldering is to add a stiffening wire to the layer. Cut and strip a piece of wire. The wire should be long enough to cross the entire layer. Now solder the stiffening wire to the cathodes along the bottom of the layer. See the image above. One thing to note here is that although one piece of wire is sufficient, adding one or two more would not harm. At this point you will have one complete layer. Time to remove it from the template. This should be done carefully so that you do not put too much stress on the joints. Lifting it up gently with a screwdriver should help. Do not be in a hurry, gently freeing the LEDs first may help. Put this layer to one side and repeat another 7 times. Now that we have all of the layers built I suggest that they are tested once again. This repeated test may save you pain later. Just imagine how difficult it will be to fix a bad joint in the middle of the cube. We are just checking that the LEDs are still connected and none of the joints have been broken removing the layers from the template. Now drop one of the layers back into the template. What we now need to do is to place a second layer on top of this one so that the anodes of the layer in the template touch the anodes of the LEDs in this layer. Once in place we need to solder the anodes together – good game, good game. I had the advantage of having a few clamps which could be adjusted vertically as well as horizontally. I would imagine that cardboard (or wood) shaped to the correct height should help support the layers. Remember that whatever you use you will need to be able to remove it without damaging the cube. Now you have the layer supported, solder the anode of the LEDs in the top layer to the anode of the LED in the layer directly beneath it. 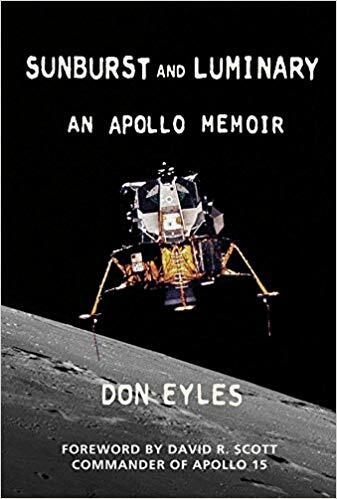 Once this has been done – test. Connect the cathode of the bottom layer to ground and touch each of the legs on the top layer in turn with the +ve supply (going through the current limiting resistor). The LED on the bottom layer should light. Move the cathode to the top layer and repeat the test, this time the LED on the top layer should light. Repeat adding the remaining layers. Just for safety, I would test every layer in the cube as it is built up. This repeated testing sounds like a big overhead but trust me it’s worth it. So at this point you should now have a cube and if you are like me, lost two days of your life in pursuit of happiness and all that is good in life. Sunday, March 18th, 2012 at 5:00 pm • Electronics, Netduino • RSS 2.0 feed Both comments and pings are currently closed.